Tonya Laymon joined the All Souls staff in July 2018. She earned her Bachelor of Music degree in Music Therapy at Marywood University in Scranton, Pennsylvania. During her time at Marywood, she sang in University Singers, Jazz Band, and Chamber Singers where she served active roles as librarian, section leader, and student director. Tonya also participated and was a featured soloist in the following performance ensembles: The Robert Dale Chorale, flute ensemble, percussion ensemble, and wind ensemble. She was also the Assistant Director of the Marywood University Children’s Chorus. After college, she worked as a Music Therapist in several juvenile detention centers and state hospitals in both Pennsylvania and Connecticut. While working as a music therapist, Tonya went back to school to earn her certification in music education. 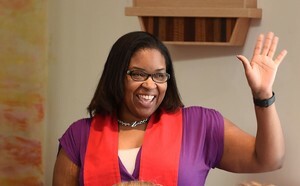 Tonya also earned a Master of Science degree in Educational Leadership at Purdue University and a 6th Year Master of Science degree in Music Education from Central Connecticut State University. Currently and for the past ten years, Tonya teaches high school music at Norwich Free Academy. Under her direction the choir department has tripled in size and all of her choirs have scored superior ratings in various music festivals. She also teaches Beginning, Intermediate/Advanced piano, and three levels of Music Technology. She has previously taught in the Hartford School District, East Haven School District, and the Tolland School District teaching everything from high school/ middle school/ and elementary choir, piano, guitar, to elementary band. She has been involved in the Connecticut Music Educators Association, where she served many years as the Adjudication Chair and served one term as the Eastern Region Director. She has been a guest conductor for numerous High School Music Festivals in Southeastern CT. But mostly importantly she is a proud mother of a teenage daughter who is also proving to be an accomplished musician who plays the French horn and the cello.